Take four to five whole garlics, separate the flakes and peel the skin. For the pickle, use garlic with small size flakes (Naattu Poondu). If the flakes are big then cut it into two to four lengthwise. Take a cup of garlic flakes and keep aside. Soak tamarind in water and squeeze out a cup of thick juice. In a dry kadai put the coriander seeds, cumin and fenugreek one by one and fry till it slightly changes its colour. Cool it and powder it. In thick bottomed kadai put the oil and when it is hot add mustard. When it starts pop up add asafoetida powder and curry leaves and then add garlic flakes. Fry the garlic till it become light brown. Add tamarind juice, red chilli powder, turmeric powder and salt. Mix it well and allow to boil. Then add coriander/jeera/fenugreek powder and stir well. Add jaggery powder and cook till it is thick. Remove, cool it and store it in a jar. Goes well with Curd Rice. thank u ..yeaaaaaaaa I got it..thank u mam..My son is asking this garlic pickle.. Please try and let me know your feed back. If you want to keep it for more days, then you can add 2 to 3 teasppons of lemon juice or vineger after removing from the stove. 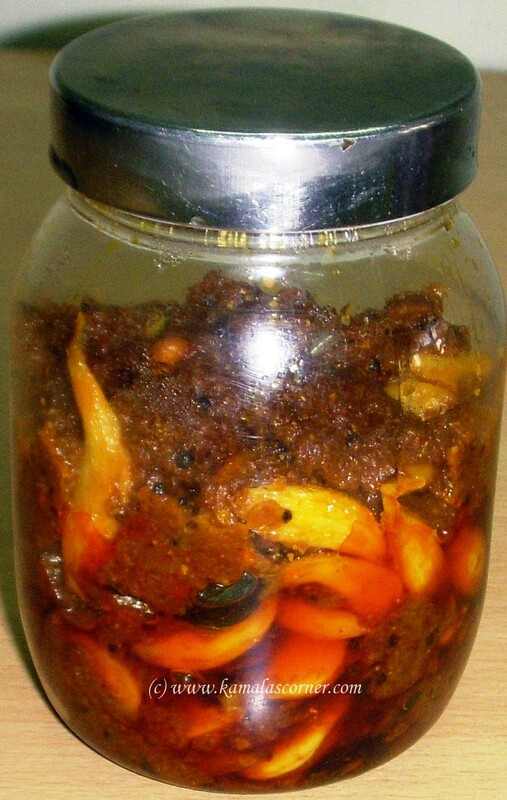 Its very yummy ….Reninded me of my mom’s version of garlic pickle. Thank u so much.. this recipe is awesome.. tried it out and it has come out really well.. this is my first time in preparing pickle.. and the outcome has really motivated..
Nice to hear this pickle came out well for you. Thank you for the feed back. Thank you Naina for your feed back. It is a good idea to add lemon juice and with mustard oil. If you keep it refrigerator, it will stay good for a month too. But ensure to use only dry spoon. Thank you Shanty for your feed back. I want to thank you from the bottom of my heart for such a simple and tasty garlic pickle recipe. I made this for lunch and my whole house smells drool-worthy! Mmmmmm…..I’m so happy and I can’t wait for the positive feedback when my husband comes for lunch. I love reading & following your recipes.. they are very authentic, as i have observed in several south-indian homes.. I have a question on this one.. you have mentioned that we need to fry the coriander seeds, cumin and fenugreek one by one.. is it must to do it separately ? or can we roast them together? Frying time for each ingredient vary. If you put all ingredients together, cumin, fenugreek like items fry very quickly and coriander seed remain under fried. If you fry for more time, then the mustard and other small ingredients get over fried and taste bitter. That is the reason, ingredients are fried separately. I’m going to prepare this by the coming weekend. I got 2 queries. Kindly help me in finding the answer. 1.) Can the quantity of Red Chilli Powder be l’lle reduced ?, 2.) Do I have to use only ‘Gingelly Oil’ (or any ‘Refined Oil’ ) ? I don’t want to compromise on the ‘Quality’ or ‘Taste’ part. Kindly suggest. If you reduce the quantity of red chilli powder, you will not get the pickle taste and it will be like eating raw garlic. Also you can use any oil. However for pickle, gingelly oil will give the unique taste and also it is healthy oil. I’ve made this pickle at home last Sunday. It was very good in taste. Thanks for the recipe. Only a doubt needs to be cleared – while I shared the pickle with my Local (Chennai) colleagues, they suggested me NOT to mix the taste of Sweetness (of jaggery) & Spiciness (of Red Chilli Powder) together, as b’coz they prefer ‘Spiciness’ of the pickle. So my query is – a.) Can this pickle be done without adding jaggery? b.) If you suggest – ‘No’, what are the reasons? Adding jaggery is to reduce the spiciness in the pickle. You can make this pickle without adding jaggery also. how is this different from Poondu vetha kozhambu ? 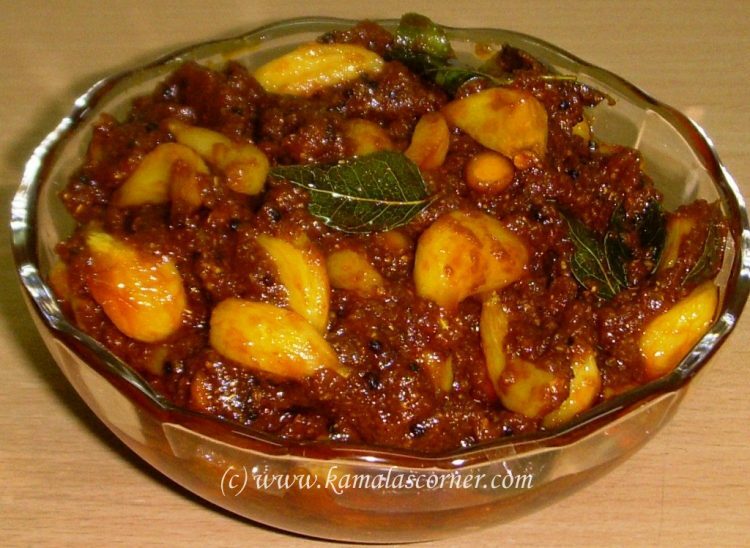 Vatha Kuzhambu is prepared with tamarind juice and it is flowing consistency with less spice than the pickle. Kuzhambu can be mixed with rice and eat. But pickle should be used with non spicy dishes like curd rice, plain roti etc. I am going to make it tomorrow.For how long we can store this pickle.Also i have some small red chillies from my garden,can i dice and use them and reduce quantity of red chilly powder. It will stay good for a month or even longer if you use only dry spoon without touching the pickle by hand. Also you can use red chilli. However, the taste will slightly differ. First time visiting your blog and I tried this recipe. It is absolutely delicious! I would never have thought to make my own garlic pickle, but thanks to your recipe I can make it very easily. Thank you for sharing your recipe. How long can we keep this pickle.. I mean the shelf life? ?